I was just on driftmotion. com and they are selling a new r154 transmission for $2599. That's what I found out by doing some research it's a air to air intercooler. The previous owner claims that he was making 800 hp with a different ecu .From under the car I can see a chain that is bolted to the frame and goes around motor. Thanks for the reply. Last edited by 05on94; 02-09-2019 at 12:48 AM. Hagerty's just listed it again in their article today "8 classics that could be yours for under $10K"
This one sold for 12K . That's US price I guess. I'd love to see how many "Concours" level Mk3's exist out there. My guess it's less than a dozen or so world wide. It'd be a trip to see one in person. I'd like to know how many JZA70 R type are still on the road. They only made them from 08/1990 to 04/1993 if I'm not mistaken. Last edited by 05on94; 02-10-2019 at 07:29 PM. i just bought a 1992 gte, 5 speed. didnt pay anywhere near 16k. those prices are inflated for sure. Sweet! Do share! I love seeing those 91 92s! 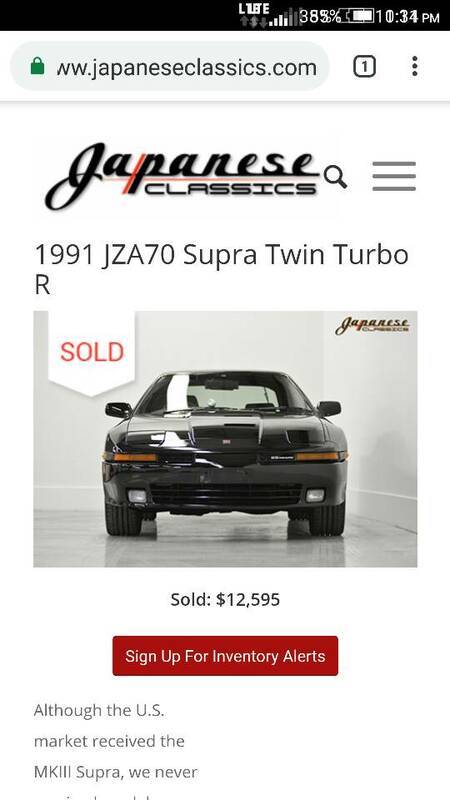 I'm happy to report that the mk3 supra just went up in value 20 k due to no new TOYOTA sports car being released! Well that certainly looks like a great find for under $4k! Need some body work on that rear wheel arch? it does, little rust. nothing bad. going to have it cut out and fixed the right way instead of the bs patch job someone else tried to do. I think they are going up in value. I have an 89 7mgte r154. I'm going to do a 2JZ-GTE swap. I'm wondering if the swap will boost the value even more.